The Proton is a large Russian launch vehicle that has been the heavy-lift workhorse of the Russian space program for over three decades and today plays a key role in building the International Space Station (ISS). Capable of delivering 21 tons to low Earth orbit, it typically uses three stages, all powered by storable liquid propellants, although a fourth stage can be added for higher-altitude missions. The first stage layout is unusual, comprising a central oxidizer tank with six fuel tanks and engines arranged in what appear to be, but are not, jettisonable boosters clustered around the base. The Proton originated as the UR-500 – a design for a two-stage intercontinental ballistic missile capable of lofting the heaviest warheads in Russia's arsenal. But in 1961 it received approval from the Kremlin to be developed into a space launcher for a manned flight around the Moon. When this concept was abandoned the Proton found alternative use as the launch vehicle for the main components of the Salyut and Mir space stations. It has also launched large payloads into geosynchronous orbit and interplanetary missions, including the Vega probes to Halley's Comet. 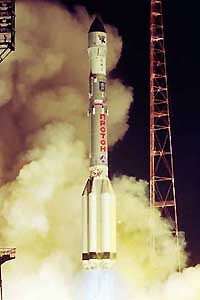 In 1997, Lockheed Martin signed an agreement with Russia to market the Proton internationally as part of their International Launch Services subsidiary. Today it continues its workhorse role by delivering the largest Russian elements of the ISS. A new version, the Proton-M, is planned which will use a Breeze-M fourth stage – an upgraded form of the Breeze-K currently employed as the Rockot third stage – to increase geostationary transfer orbit payload capacity by 25% to 5,500 kilograms.